The northern section of Utah's Canyon Country offers Canyonlands National Park, a portion of the Manti La Sal mountains and forest, Newspaper Rock, and other great scenic attractions. Stay in Monticello, La Sal or the south-end of Blanding for a close base to experience these options. In this region you'll enjoy wildlife viewing, hiking, rock climbing, mountain biking, jeep / off-road touring, and more. Canyonlands National Park is the largest in Utah, covering 527.5 square miles. The park is divided by the Colorado and Green Rivers into three distinct districts: the Island in the Sky, the Needles, and the Maze. Horseshoe Canyon is also part of Canyonlands National Park but is geographically separate. The rivers and their tributaries have had a major hand in designing this natural wonder where canyons, mesas, and buttes typify the primitive southern Utah desert landscape yet each section is highlighted by its own unique characteristics. Renowned American author Edward Abbey called Canyonlands National Park, 'the most weird, wonderful, magical place on earth.' Visitors will quickly see why. The Island in the Sky district is a massive mesa elevated more than 1,000 feet above the surrounding landscape, with panoramic views of spectacular canyon country up to 100 miles in every direction. The district is defined by the Green River to the west and the Colorado River on the east. A paved road with several scenic pullouts leads from Moab to Island in the Sky, making it one of the easiest areas to explore. Island in the Sky district can be explored in as little as an hour, by driving to Grand View Point and Green River overlooks for a broad view of Canyonlands National Park. A half day will also allow time for a few short hikes. There are several short trails (all two miles roundtrip or less) atop the mesa, including Aztec Butte, Grand View Point Trail, Mesa Arch, Upheaval Dome Overlook Trail, and Whale Rock Trail, as well as access to longer trails like Murphy Loop, Syncline Loop, Lathrop Canyon, and Taylor Canyon. The White Rim Road Trail runs for 100 miles below the mesa top, offering spectacular views and multi-day mountain bike and four-wheel drive trips. Trail maps are available at the visitor center, which is open daily and has limited services. Overnight visitors can stay on a first-come basis at Willow Flat Campground, which offers year-round camping at their twelve sites, plus grills, picnic tables, and vault toilets. Be sure to bring bottled water and food, as no other services are available in the park. Ranger-led activities are available from March through October. The Needles district is named for the Cedar Mesa sandstone spires that jut up from the landscape. Located in the southwest section of Canyonlands National Park, this district is well-known for its natural formations, extensive interconnecting trail system, and more than 50 miles of rugged roads. The Needles district can be accessed from towns along Highway 191 by heading west on Highway 211 to the Visitor Center, which is open year-round. From there, a scenic road winds through a section of the Needles to Big Spring Canyon Overlook for an expansive view. Stops along the way include Roadside Ruin, Cave Spring, Pothole Point, and Slickrock Trail. Short interpretive trails at these stops are a great way to experience the park for visitors with only an hour or two to explore. Those with half a day to explore can hike the 2.4-mile Slickrock Trail or drive to the Colorado River Overlook. A full day or more allows time to hike some of the longer trails, like the Chesler Park Loop/Joint Trail, Elephant Canyon/Druid Arch, Confluence Overlook, Big Spring to Squaw Canyon, Squaw Canyon to Lost Canyon, and Peekaboo Trail. The longest trails, Lower Red Lake Canyon (18.8 miles) and Salt Creek Canyon (22.5 miles) may require overnight camping. Trail conditions are rough, typically slickrock or very sandy, and are marked with cairns. There are few water sources. Hiking isn’t the only way to explore the Needles, however. More than 50 miles of rugged roads requiring a high-clearance, four-wheel drive vehicle lead through some of the most challenging backcountry Canyonlands has to offer, including Elephant Hill, the Colorado Overlook, Salt Creek, Horse Canyon, and Lavender Canyon. Permits are required for all overnight backcountry trips, whether by vehicle or on foot. Roads may close due to inclement weather. There are three small campgrounds in the Needles district to accommodate overnight visitors: Squaw Flat, Wooden Shoe, and Split Top. Squaw Flat Campground is the largest, with 26 sites, bathrooms, grills, picnic tables, tent and RV pads. Campgrounds fill fast from March to October, and reservations are required for large groups. Squaw Flat Campground is the perfect base camp for a number of half- and full-day hikes accessible from the Elephant Hill Trailhead and the Squaw Flat Loop A Trailhead. There are five backcountry vehicle campsites with a limited number of spots. Moab, La Sal, Monticello, and Blanding offer convenient access via paved roads to the Island in the Sky and Needles districts inside Canyonlands National Park. From Highway 191, take Highway 313 to Island in the Sky, or take Highway 211 to reach the Needles district. Dirt roads leading to the Maze district require a four-wheel drive vehicle and may be impassable in wet weather. Canyonlands National Park is open year-round. The La Sal Mountains are located twenty miles south of Moab. Part of the Rocky Mountains and Manti-La Sal National Forest, they are Utah’s second highest mountain range. More than a dozen mountains in the range have peaks above 12,000 feet, with Mount Peale the highest at 12,721 feet. The La Sal Mountains reside on the Colorado Plateau along with the Abajo and Henry mountain ranges. All three ranges are roughly 25 million years old, significantly younger than nearby ranges, and were formed by igneous rocks and the erosion of sedimentary rocks from the Permian and Cretaceous periods. The La Sal Mountains are named for the Spanish word for salt. The compact range is only 15 miles long and six miles wide, but outdoor enthusiasts head to the La Sals year-round for sightseeing, hiking, biking, off-roading, camping, photography, trout fishing and more. The La Sal Mountain Loop Road (FR-062) is a great way to explore the range. The 60-mile paved scenic loop begins six miles south of Moab on U.S. Highway 191, traversing the timbered mountains with expansive views of the red rock desert below and mountain peaks above. Changes in flora reflect the altitude, climbing past pinyon and juniper trees to Ponderosa pines and quaking aspens, with spruce and fir trees at the highest elevations. La Sal Mountain Loop Road loops from Moab to Castle Valley, Geyser Pass, and back again. Tight turns near Castle Valley may prove difficult for large RVs to maneuver. There are several overlooks and spur roads along the loop that lead to pretty lakes and off-road trails. Geyser Pass Road leads to Oowah Lake for excellent trout fishing, and a five-mile graded dirt road leads to popular Warner Lake. The La Sal Mountain Loop Road loops back to Moab shortly after the Warner Lake Turnoff. Eastland, a small community, is located eleven miles east of Monticello and four miles south of US 491 on County Road 312 (Horsehead) at an elevation of 7050 feet. 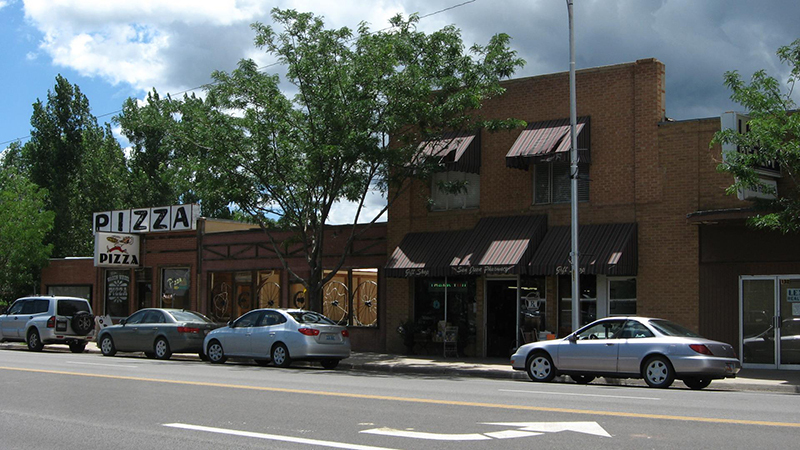 Eastland is approximately fifteen miles west of the Utah/Colorado border. The community began in the 1920s as a cluster of farms and homes amid large bean and wheat fields. Eastland remains small and is still surrounded by cultivated fields. Its estimated 2000 population was 130. It does not provide city services; however, the community maintains a well, and pipes water to individual homes. La Sal is an unrivaled outdoor playground offering recreation opportunities throughout the year. Dirt roads lead to some of the best camping in Utah. The name of the town comes from the Sierra de la Sal, bestowed by Spanish traders as early as 1750 and referring to the snow capped peaks. Detailed information appears in the 1776 diary of Father Escalante's exploration of the area on the Dominguez/Escalante Expedition. La Sal hosts the La Sal Mountain 5K Race in June, the Hike to Mt. Peale in July, and the La Sal Mountain Summer Festival in August. During the winter you can ski or snow-shoe on the mountain one day and hike the desert canyons the next. Popular day tours include Arches and Canyonlands National Parks, Dead Horse Point State Park, Canyon Rims Recreation Area, Manti-La Sal National Forest, and Looking Glass Arch. Lodging, dining, and tours available. The tiny town of La Sal is located on the flank of the La Sal Mountains at 7000 feet in elevation and is the northern most community in San Juan County. It is thirteen miles west of the Utah/Colorado border and forty-two miles north and east of Monticello via US 191 and Utah 46. The area was first loosely settled by ranchers. It has survived uranium booms, oil and gas exploration. Estimated 2000 population was 400. La Sal supports a community center and provides volunteer fire protection. City utilities are not available in La Sal; each property owner maintains a well and a septic tank. Sheltered by the Abajo Mountains, Monticello is a cool and peaceful summer get-away. Natural vegetation grows to form the image of a blaze-faced horse on the mountains west of town. 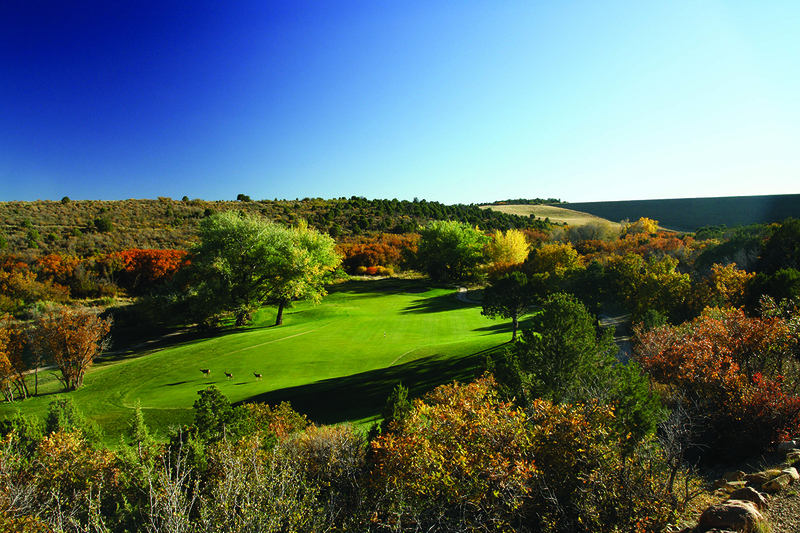 Opening in the summer of 2002, the Hideout Golf Course offers visitors a pleasant 18 hole course with no crowds and perfect summer temperatures in the 80s. The Blue Mountain Triathlon is held in March, Pioneer Days in July, and the County Fair and Rodeo in August. Tour historic replicas in Pioneer Park and visit the Frontier Museum for a glimpse into western frontier history. Monticello is a center for hunting in the fall. Popular day tours include Canyonlands National Park, Canyon Rims Recreation Area, Manti-La Sal National Forest, Needles and Anticline Overlooks, Lowry Ruin, the Anasazi Heritage Center, and Mesa Verde National Park. Tours of a local buffalo herd are available. Full services. For more information on Monticello, visit MonticelloUtah.org. Monticello, the county seat, is located at the intersection of US Highways 191 and 666, forty-two miles south of La Sal. At 7069 feet in elevation, Monticello is nestled against the eastern side of the Abajo--or Blue Mountains--with easy access to mountain recreation. Wheat fields spread from Monticello to the north, east, and south. Ten miles to the north the desert begins to encroach. Designated by the Federal Government as a Superfund Site, a long unused uranium mill has recently been remediated. The Monticello Foundation has been established as a non-profit foundation to provide support for the community of Monticello to promote, sponsor, and carry out charitable and related activities within the City of Monticello. In addition to the new golf course, the community supports a covered public swimming pool, four public parks, a lighted sports field, and tennis courts. Loyd's Lake is nearby and maintained as a city park with a hiking trail, picnic area, volleyball court, and horseshoe pits. Monticello's estimated 2000 population was 2000. Monticello provides law enforcement within the city limits. The city and the county cooperate when necessary. Monticello also provides volunteer fire protection and maintains zoning ordinances. Water, sewer, and garbage collection are provided within the city limits. Monticello Airport, north of Monticello on US 191, maintains a 4800-foot paved runway, a beacon, medium intensity runway lights, and two hangar buildings which accommodate eight aircraft and minor repairs. For more information on Monticello, visit MonticelloUtah.info. Located north of Monticello on US 191, this airport maintains a 4800-foot paved runway, a beacon, medium intensity runway lights, and two hangar buildings which accommodate eight aircraft and minor repairs. Monticello Airport is staffed from 8:00am to 8:00pm spring, summer, and fall; and 8:00am to 5:00pm during the winter. Lo Lead and Jet A fuels are available.